Materio Theme for phpSound - CODELISTPRO | Free Premium Scripts, Plugins, Apps Source Code. 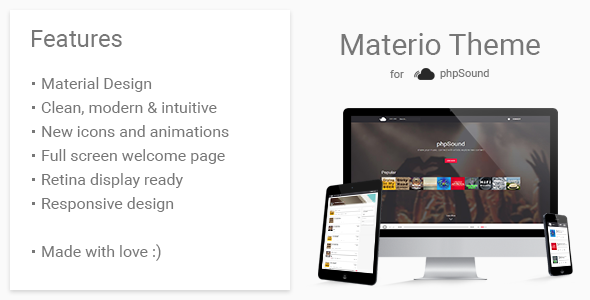 Materio is a Theme for the phpSound Music Sharing Platform featuring the new design concept called Material Design. Also featuring retina display ready, cross-browser compatible and mobile responsive, Materio offer a great and intuitive navigation experience for your users.